National Doctor's Day is held each year on March 30 in the U.S. Last year, we decided to have a post about the day, celebrating and thanking physicians. We posted this on Facebook, Instagram, and Twitter, and it was one of the week's highest performing posts on each platform. This year, we wanted to publish a similar post for Doctor's Day, which was last Friday. Our team selected a historical quote from Dr. Will Mayo and it was added to a photo as a text overlay. The quote in the photograph immediately sparked discussions. "Each day as I go through the hospitals surrounded by younger men, they give me of their dreams and I give them of my experience, and I get the better of the exchange." Most discussions were about the beautiful sentiment of the quote and how thankful followers are for their physicians. A very small discussion, however, was about the quote itself. 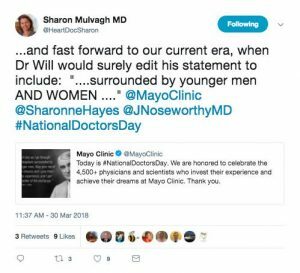 Some of our team members felt uneasy about sharing a quote that explicitly states a single gender but felt it was ok to share the 1930s quote when it was accompanied by the post text, "...celebrate the 4,500+ physicians and scientists..."
On Saturday, when the post was 24 hours old, it had received 6.1K likes, 715 loves, and 30 wows on Facebook. We suspect the wows are expressing concern about the post's non-inclusive quote. Our team was saddened that we "missed the mark" on this one. We had absolutely no intention of posting non-inclusive content. In fact, our team that created this post is comprised of five women, and we were not offended by the quote. We decided that moving forward, our posts using historical quotes will not have gender-specific references, but if the best quote for the purpose does have a gender reference, we will either use a bracketed edit (e.g., replacing "men" with [doctors]) in the quote, or use the original quote and add specifically inclusive language (e.g., "men and women") to the accompanying post. There are pros and cons to either of the latter options. On all platforms, when our post includes both text and an image, our followers pay more attention to the image. I'm guilty of it. As I scroll through my newsfeed, I seldom read the text or caption of a photo, especially if it has text in it. I assume that the text is a reiteration of the text in the image. Posts celebrating our staff receive high engagement. This is true at any hospital, regardless of its size. I've worked at a hospital with 4,500 employees and one with 60,000, and staff appreciation posts are always top performers. National Nurses Day is Sunday, May 6, and we plan to publish a celebratory post then too. We don't often post things that could be perceived as "patting our own back," but the fact is, we wouldn't have a hospital without our doctors, scientists, nurses, techs, assistants, business people, housekeeping staff, maintenance workers, and volunteers. We must think differently when we create and curate our social media content. Mayo Clinic empowers women and minorities by being a diversity and inclusion leader not only in the healthcare industry but in business globally. It's integral to our mission and the social media team will ensure that it resonates in our posts. Have you run into a similar situation? What did you do? What would you do in our situation? Any advice on what should be our best option moving forward? National Doctor's Day is held each year on March 30 in the U.S.
Each day as I go through the hospitals surrounded by younger men, they give me of their dreams and I give them of my experience, and I get the better of the exchange.